Have you stumbled upon a file using the extension DAT and aren’t sure about what’s it used for? If the answer is yes, you’ve come to the right place. 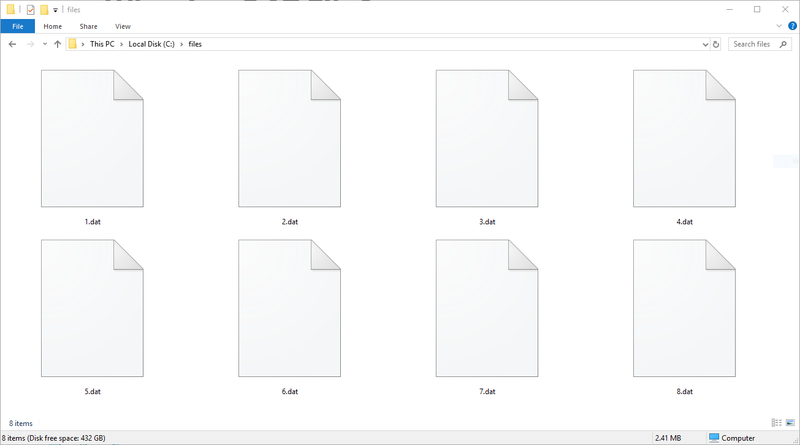 In this article, we’ll look into DAT files, how to open, read, and convert them, as well as the way to differentiate between multiple types. DAT files are used for storing a set of data which is only needed for a specific application. While most of the time these files are found alone, you can sometimes find them together with DLL files which also have a similar function. A common way of finding a DAT file is when receiving email attachments that contain it. If that’s the case for you, it’s important to figure out what it refers to. As DAT files can be associated with lots of different applications, opening and reading them can quickly become an issue. Because no single program is responsible for its creation, the first step when trying to open a DAT file is to determine its type. There are multiple kinds of DAT files including text-based or video-based ones. It’s not always a straightforward process to figure out how to open a DAT file, but using a basic trial and error method we could get somewhere. An important clue is regarding the bigger context of where you’ve stumbled upon the DAT file. This could narrow down your list of options, but let’s start the process by working our way through the possible types of DAT files out there. The first try when opening a DAT file should be with a text editor like the classic Notepad. It’s very likely that your DAT file is a text-based one so a built-in application like Notepad can open it. You can try more advanced programs, but any basic text editor will do. If that DAT file is a text-based one, you can now read what’s inside and find clues regarding the application association. Remember, you need to figure out which program is associated with a particular DAT file. Text-based DAT files are simpler, but other types can be more complicated. Before moving on to other types, it’s worth mentioning that some DAT files don’t allow editing or any other kind of modification like moving it or deleting the file. These are locked files which are most likely important for the program because they usually act as configuration files. Such a file can be often discovered in the installation directory of that particular application. You can sometimes find DAT video files which certain video editing programs or similar rely on. Like in the text-based example, finding clues is a crucial process to determine what type of file you’re dealing with. You can look for the folder where you find the DAT file and if it appears to be linked with a certain video editing tool, it’s safe to say the file in question is video-based. Even if the DAT file is video-based, don’t think it could be useful to try and open it. If it’s found in a program folder, chances are high for it to simply contain computer code so it may not be of any use to look into it. So far, we’ve seen that DAT files can be of different types. They all have some specific functions for the programs that need them. But what about DAT files that seemingly appeared out of nowhere without clues about its possible function? We’ve briefly mentioned receiving these files as email attachments because that is often a situation when people discover DAT files. If you’ve received such a file by email, the most likely cause is a malformed attachment from Outlook or Windows Live Mail. It’s usually a Microsoft email client that sometimes experiences this issue. You would probably see the actual file as something like ‘winmail.dat’. To figure out what this file means you can upload it to an online tool like this one which allows you to see the contents of the file. It’s absolutely free and very simple to use. A more powerful software for opening DAT messages is Winmail Opener, a free program that extracts the attachment. If you’re a macOS user, there’s a helpful software for dealing with DAT files too. It’s called Klammer so check it out if you’re curious about the contents of a DAT file. You can expect to discover a different type of file in a DAT attachment, like a PDF or a JPEG file. With the help of a basic file converter you can usually convert many types of files but, as we’ve seen so far, DAT files are different. You can’t convert all DAT files using the same method, it depends on the type of DAT file you have. As previously mentioned, messing with program specific DAT files isn’t a good idea, so don’t try to convert those. You could turn the file into an unusable one and affect the program, particularly if that file stores essential configuration data. One trick that’s worth trying if you know what kind of file you were expecting to receive in the email is to change the extension. Although it’s not really possible to do this for recognized files, those that your computer can’t identify can be converted this way. If you were expecting a picture you could try renaming the DAT file to PNG or JPG. Of course, you need to ensure that Windows is configured to accept file extension renaming. Did you find our article helpful? Then you might also be interested in our articles about What is PCI Express and How to Take a Screenshot on a PC.